Over the course of the last year, we've been reporting on the numerous aircrafts that have been illegally landed in remote parts of the country. Since November 2017, there have been 13 so far, and in majority of these cases, local law enforcement arrived after the planes have either been destroyed, or abandoned, and whatever cargo - most likely cocaine - was already removed. In many instances, the authorities couldn't say for certain what exactly was smuggled into the country, which only adds to the mystery. For the most part, the general public has had to speculate, but one civilian says that he can offer insight into the movement of these illegal landings. More than that, he says he has proof that police officers and politicians are involved, and are complicit in drug transshipments moving through Belizean territory. He's Edward Martinez, and he says that he knows all this because he used to operate in the contraband underworld. He has a Facebook page, on which he refers to himself as "Drug Hunter". Several of our viewers have reported seeing posts from him last year, in which he accurately predicted the illegal landing zones that some of the suspected drug planes have used to safely transit through Belize. So, how can a civilian's information network be more precise than the entire police departments in these instances? That's what the press tried to get from him when he stepped forward on national television this morning to act as a whistleblower. "I once told you, a few minutes ago, that I'm no saint. I used to be in the contraband world, but not the contraband of drugs. Let me stipulate that one time. I used to run whisky, cigarettes and these things through the border. You pick up friendships that ends up leading elsewhere. You end up getting your little police friends that those same little police friends end up climbing the ranks the same way. If you would ask me how is it that I can pinpoint the exact location the plane will land, I can answer that for you, instantly. 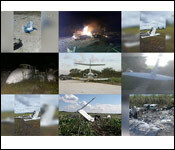 I have a tie in Guatemala that deals with that, that deals with the tracking of planes." "When something is coming, and I know about it, I can either check Honduras or Guatemala." "Any name that I call, I will present evidence to support it because nowadays in Belize, people don't like to accept the facts. They want to cry, 'I will lawyer up. I will sue you.' I'm inviting them to do it because the evidence that I have, trust me, not only do I believe that they would be fired, they probably would be prosecuted." "Many will ask, 'well how do you know?' Many will say, 'Well, he had to be involved. He must not have gotten his share' You know how social media goes. This has nothing to do with shares, bad feelings or a crossed deal. This is about what is right. I have a son; I have children. I have many children." "I don't do anything without a contingency plan. The minute I walk out there, and a stray shot hits me, or you hear, 'He was in the wrong place at the wrong time, and they had a shoot-out, and unfortunately the poor man got hit.' They better know something, the minute the poor man get it, I have people who will disseminate everything out there, because I won't die just for accusations . If you will kill me, somebody is going with me. I will damage somebody's life in the process." "At the end of the day, they could send somebody to shoot [me]. Come good because I will shoot back." Of course, these were only snippets of a 76 minute interview that Martinez granted today, and in the discussion, he named several high-ranking police officers who he says are directly involved in the drug plane business. Of course, with no evidence to back up his claims, we cannot release the names of those police officers for liable reasons. He insists that he can prove what he is claiming, and that he has 2 upcoming press conferences he wants to call to make these disclosures. And, the initial reaction from some in the general public is mostly skepticism, and there are already attacks being launched on his credibility, with persons pointing out his past, and previous criminal charges he faced. So, while you may be tempted to write him off as delusional, shortly after his press conference, he started receiving text messages from an unknown sender who is already threatening his life, and the lives of his loved ones. In these first 2 texts, you can see the sender says that he was warned not to go public. Next, the person follows up with a death threat to Martinez's life, and that of his family, and the person name drops a high-ranking police officer, referring to him as "my boss". After that, the sender ominously harassed Martinez with 2 other text messages, stating in no uncertain terms that he is under surveillance. The most worrisome part of this communication comes when this sender says, quote, "You think that you are safeâ€¦ My 9 was on you while you were in the shop buying coke." End quote. Of course, there is the possibility that these text messages could simply be mischief-making, but it does lend credibility to the possibility that Martinez has made enemies as a whistleblower. 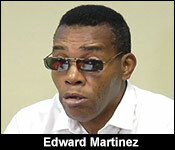 One final note is that Edward Martinez is the brother of UDP Minister Anthony "Boots" Martinez. We'll keep following his story, and we'll show you that proof if and when Martinez produces it. 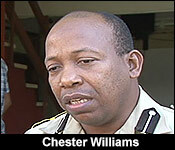 One man who may have to take what Martinez has to say seriously is Commissioner Chester Williams. This morning, when we met up with Williams in Belmopan, he said he wasn't aware of the press conference but he will follow up on the information. "I can assure you if any information that is revealed that we believe to be credible and warrants police investigation then we will move to do our own investigation to see if we can confirm or deny those allegations." 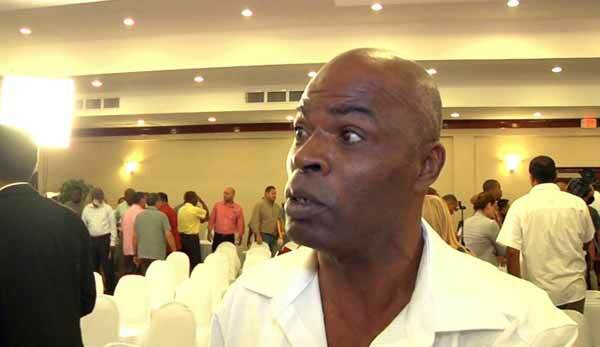 Edward Vincent Martinez, the brother of Minister Anthony “Boots” Martinez held a press conference on Tuesday alleging that several ministers of Government and high ranking politicians are involved in narco-trafficking and the landing of planes on clandestine airstrips across the country. We asked Minister Martinez about the allegations his brother has made against his cabinet brothers.